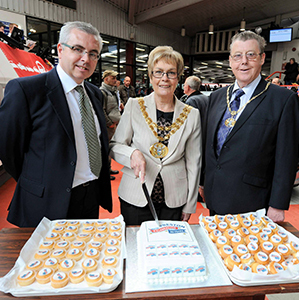 British Car Auctions’ (BCA) Preston site began their 30th anniversary celebrations with a special sale and Mayoral visit last Monday. The sale was the first in a series of events celebrating 30years of successful business at BCA Preston, which was officially opened on May 14, 1984, by HRH Prince Michael of Kent. Management and staff welcomed the Mayor of South Ribble, Councillor Dorothy Gardner, and her husband, Melvyn Gardner, on May 12 to start the celebrations. Former BCA Preston Managers and Directors Peter Teale, Malcolm Riley, Graham Carbutt and Nigel Everett also attended the event. The Mayor toured the Preston remarketing facility and stood on the rostrum as the sale commenced. Nearly 300 vehicles were sold on the day, including over sixty Wheelchair Adapted Vehicles and a large selection of part-exchange cars from Lookers, Halliwell Jones, Hadwins VW and Lake District Audi. Turnover on the day exceeded £1million. Chris Tinsley, Manager at BCA Preston, said: “BCA Preston really is the hub of the used vehicle trade in Lancashire, although customers will travel from all over the UK and even further afield to attend our sales.